Fortune cookies personalised with your own messages for PR campaigns, marketing programmes, corporate events, promotional marketing, exhibitions and direct mail. 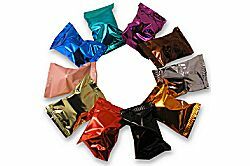 Promotional fortune cookies - everything you need for a complete fortune cookie campaign - personalised fortune cookies, wrappers & boxes - we can even handle the complete fulfilment of a mailing campaign for you. 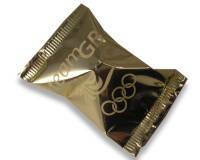 Fortune cookies are the ideal way to create impact with your next promotion, direct mail campaign or marketing event. Put your message inside a fortune cookie and you are guaranteed that it will be read - everyone always reads the message inside their fortune cookie! With the minimum order of just 300 cookies at £80 you can try out a Fortune Cookie campaign and see how it works for you - lots of our customers come back again and again! 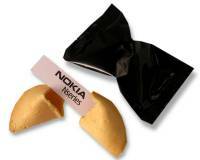 Pop your message inside a fortune cookie and send it on it's way! Delivery is just 2-4 days from order. 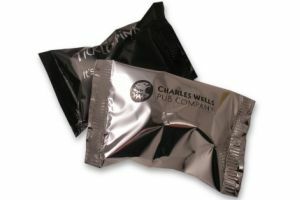 As well as putting your own words on the message slips inside the fortune cookies we can also print logos or other images and print the foil wrappers - this is one message they won't miss! 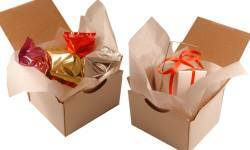 We also supply a range of presentation boxes which can used to create the complete mailing package. 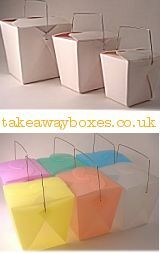 These range from individual boxes which can hold just one fortune cookie to our large takeaway style boxes which can hold upto 8 fortune cookies. 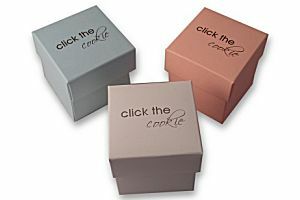 We can also personalise some of the presentation boxes - click here for details. 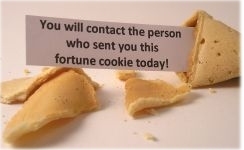 We can set up and manage a direct mail campaign with individual fortune cookies sent direct to your targets - and in just a few days! So if you need to act fast give us a call, send us an email or complete the quotation form and your fortune cookies will be on their way before you know it. Click the Cookie specialise in the production of personalised fortune cookies and we have worked with many leading companies including Barclays Bank, Sony, Virgin Holidays, Vodafone, Baileys Irish Cream, Uncle Bens, Britvic, Shell, and BUPA. 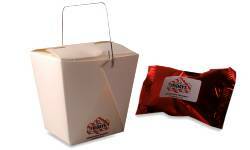 We handle orders from several million fortune cookies to as little as a few hundred. With a minimum order quantity of only 300 fortune cookies and a lead time of a few days we can help you react immediately to opportunities as they arise. Fortune cookies with your own messages are the answer if you are looking for something stylish, innovative, unusual and highly effective for your next event or marketing campaign. If you don't want to personalise your fortune cookies then you can simply order our traditional Chinese Fortune Cookies. They are available in boxes of 30, 100 or 300 - order online now for fast delivery ...click here to order. 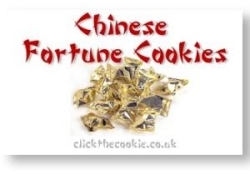 For full details and ideas of how fortune cookies can help with sales promotion campaigns, direct mail, PR initiatives, conferences, exhibitions and product launches call us on 0845 370 7252, send us an e-mail or complete the estimate request form. In addition to fortune cookies with your own messages inside we also have a large range of standard fortunes which you can personalise. We have now launched two further ranges - fortune cookies with motivational and inspirational messages. There are over 60 different quotations in each range and these can be personalised with your own messages and / or logos on the reverse of the message slip. They are ideal to support PR campaigns and sales team activities. If you are planning a wedding celebration you may like to take a look at - our specialist wedding website - which has lots of wedding ideas including unique wedding favours, wedding decorations, wedding favour boxes, personalised wedding favours and wedding table decorations. 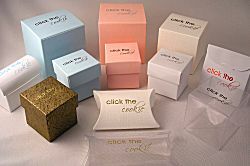 clear cupcake boxes and boxes for wedding cupcakes , cupcake wrappers, cupcake stands and cupcake toppers.